Kim Cowley and I have been friends for a few years now and bless her she does not have a blog so I let her use Practically Magickal to post her entries for Celebrate Oz because.....well it just wouldn't be an arty party without the wonderful and creative work of Kim. 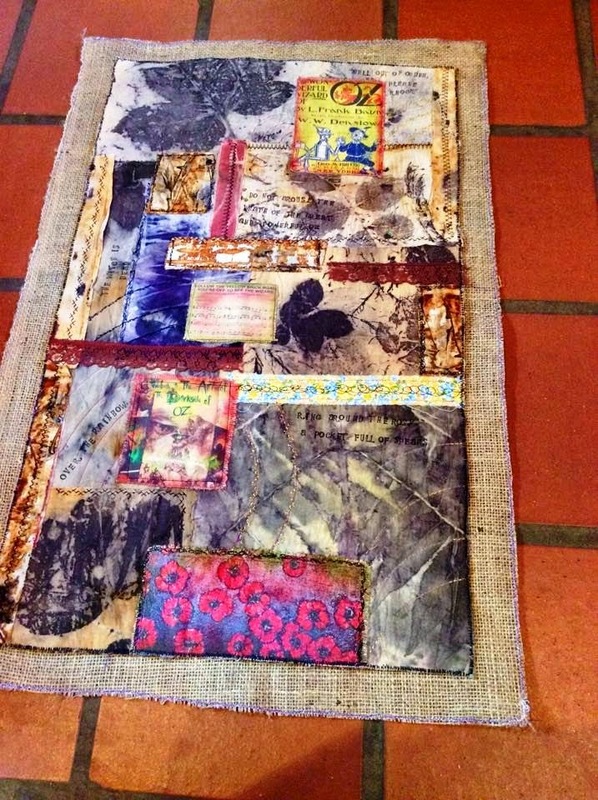 If you would like to see more of her work you can visit her Facebook page "The Kitchen Witch". Kim and her husband Martin are both artists and I am always fascinated by the work that they do. 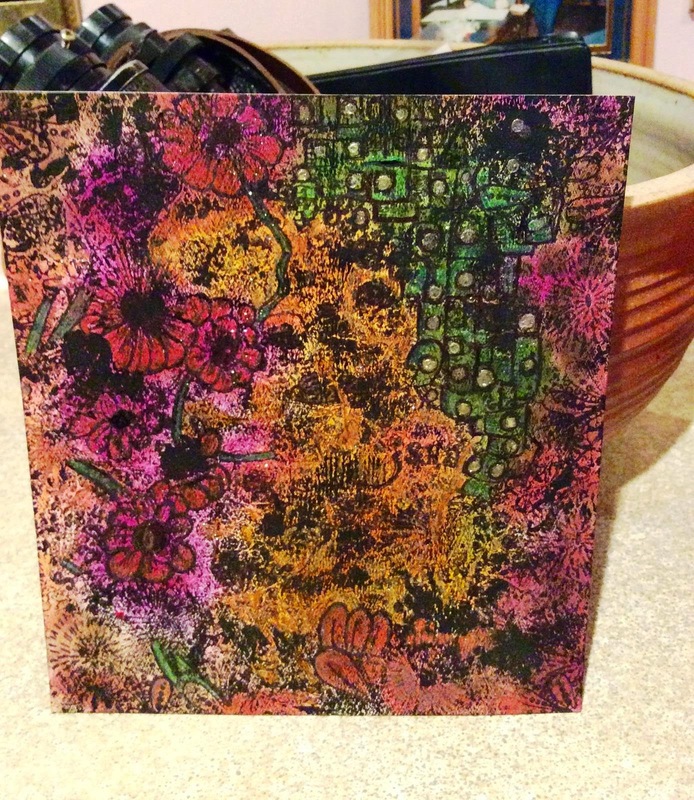 Kim is now doing "Eco" printing which is quite wonderful. 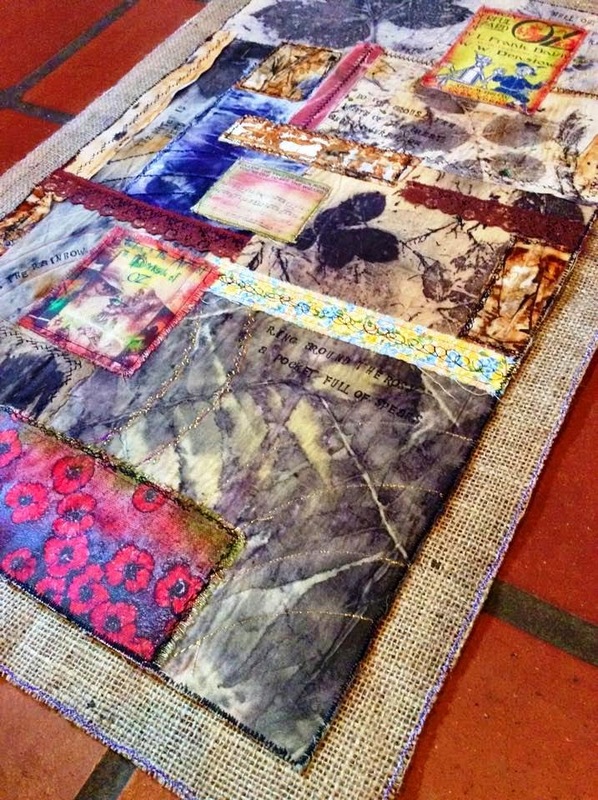 The use of nature's own beauty to create imprinted fabrics. 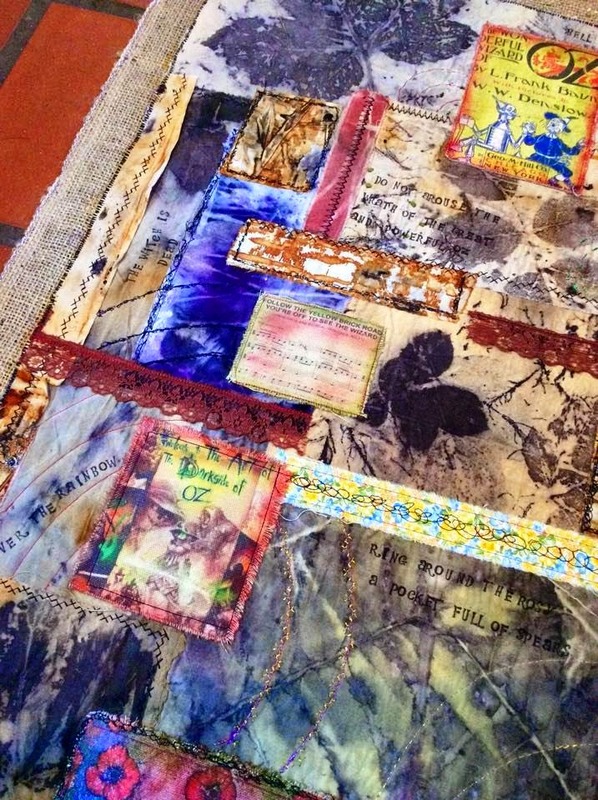 She uses cotton and silk and the images that attained are just breathtaking. So without further ado....as they say.....here is Kim's take on the Shadows of Oz - Celebrate Oz 2015. As the leaves are winging their way to the real magician, well that is not strictly speaking true, the Flying Monkey Couriers Inc seem a bit dilatory and haven't bothered to pick it up yet!! but as the leaves do have a new home the giveaway for the Oz challenge is this 6 by 8inch pen and ink drawing of Oz just as the shadow was starting to fall. Leave a comment and I'll pick a name and announce the winner on April 18. Good Luck to all. Those leaf prints are just lovely! She does very pretty work. I am so easily distracted by pointers that spread sprinkled glitter. I love the eco friendly creativity! And then I got sidetracked looking for the correct Kitchen Witch Fb page. 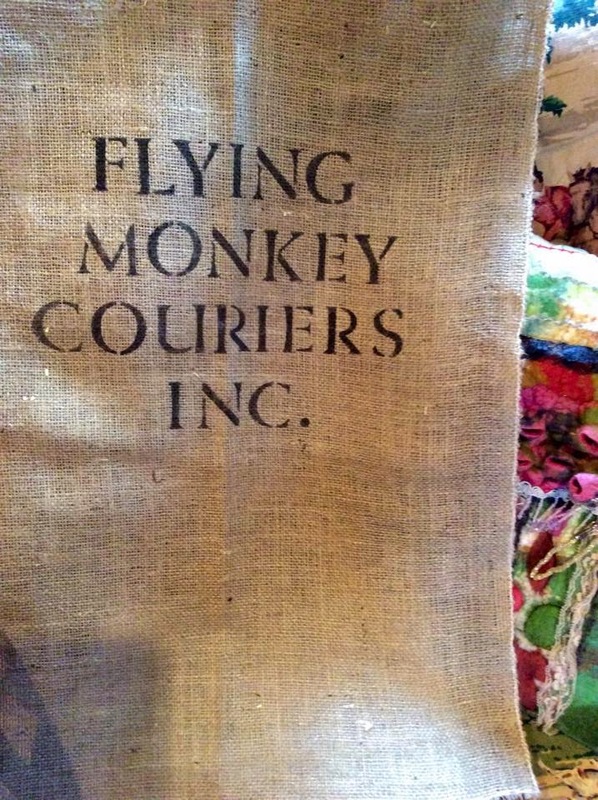 I just love the Flying Monkey Courier burlap! A lovely bit of artwork that truly shows your talents. Be sure to visit Magician of Oz and read my contribution to the Shadow of Oz. Dearest Ms. Kim, where were you these last few weeks? Seriously. We could have used your witch's talents, here in New York City. We needed some help getting rid of Old Man Winter and bringing spring. So glad the witch was able to fix it for Oz! 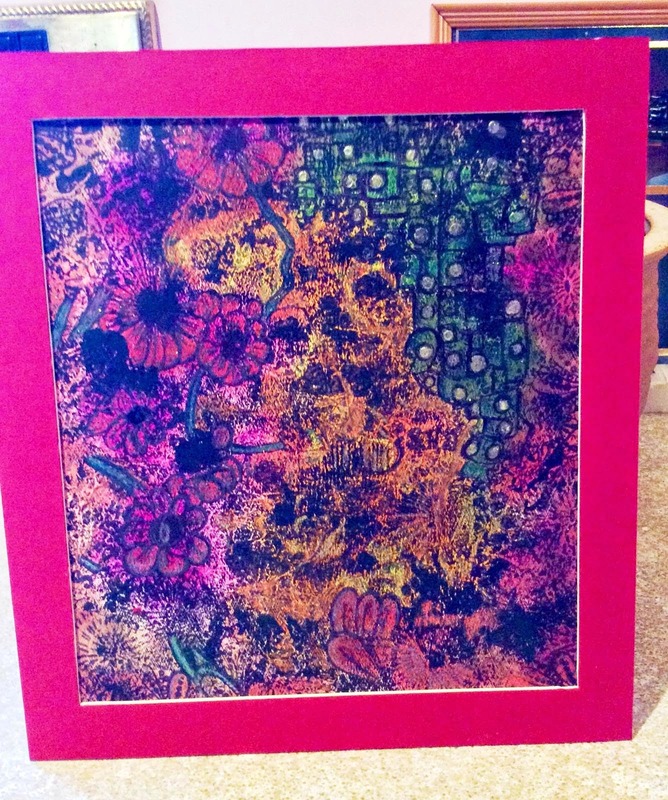 Oh, both the hanging and the pen and ink drawing are stunning! It's very nice to meet you, Kim! :) Off to find your Facebook page. What a wonderful process! These are just fantastic!